Have you ever played phone tag with one of your clients? It’s a frustrating and time-consuming cycle to be involved in and is a poor client experience for your client. You call them with results and leave a message, they call back with questions and you’re with another client so they leave message, and on and on. How would you like it if there were an easy solution to this problem? Well, there is. It’s called VitusConnect and here is why your practice should be using it.According to Pew Research, text messaging is the most widely used feature on the smartphone and 97% of Americans use text messaging at least once a day. With an open rate of 98%, you wouldn’t find it surprising to hear that 90% of all text messages are read in less than three minutes after being sent, according to Connect Mogul. But still, most people use text messaging for personal use, right? You’re wrong. eWeek shows that 80% of people are actually using text messaging for business. Plus, 77% of consumers (aged 18-34) with texting capabilities and 66% of all consumers are likely to have a positive perception of a company that offers texting services (Harris Poll). Say Fluffy just came out of surgery and is doing very well. You could wait for Fluffy’s parents to call to check on her, hope you get a hold of them on the phone or leave a voice message. 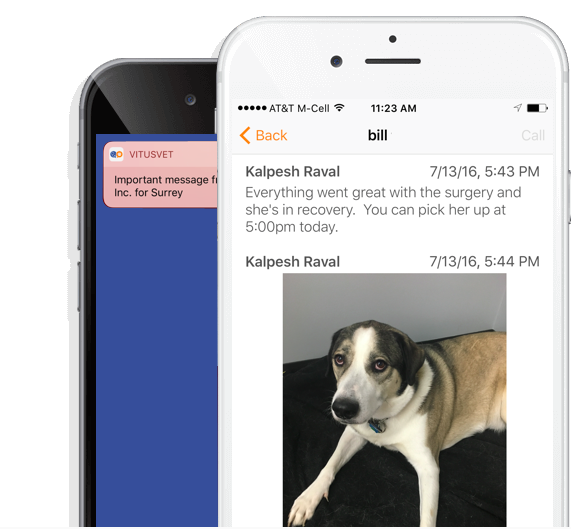 With VitusConnect, you can simply send a text message with a photo of Fluffy to let them know that Fluffy is doing great. Studies show that the way human brains are made up allows us to process visuals 60,000x faster. Most noteworthy though is that by using visuals and photos to communicate with your clients, you create up to 180% stronger engagement. So, how does this apply to your practice? Adopting a photo and text messaging app will not only provide your Client Service Representative (CSR) time to focus on the clients in the office, but it also creates a stronger engagement level with clients who are not in the office, which in turn increases client loyalty. With all that said, the question isn’t really why would you use a photo and text messaging app. The real question is why wouldn’t you use it?